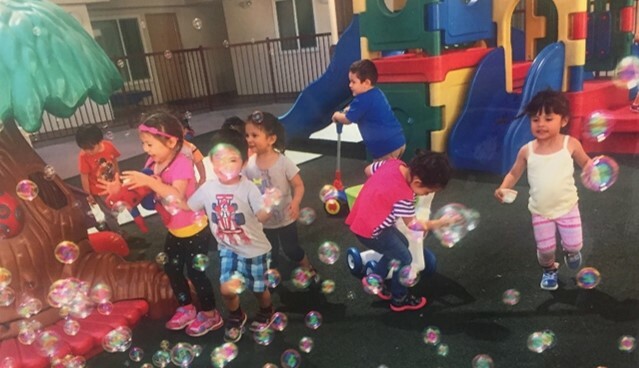 Edith Gutierrez implemented several new changes at Gutierrez Family Child Care in Los Angeles, California. When her program started, her space was very crowded and not conducive for active play indoors. In 2016, Edith decided to participate in the Early Care and Education Learning Collaborative (ECELC) to learn innovative strategies for building healthy lifestyles for the kids in her program. After learning about the importance of indoor and outdoor active play, she worked with her ECELC trainer to rearrange furniture in order to maximize her space for indoor play. Edith also integrates more structured and unstructured physical activities throughout the day and uses fun games to help the children develop physically, socially, and mentally. As she engaged the children in more activities in a more open environment, Edith discovered ways for the kids to learn about and eat more healthy fruits and vegetables. Edith now takes the time to eat and talk with the children about healthy foods and appreciates the opportunity to serve as a good role model. Vasthi Calvachi, director of Glendora Children’s Center in California, started a weekly yoga program for all the teachers and their classrooms. She read about the benefits of yoga for children and was determined to include it as a physical activity. Toddlers like playing simple games with caregivers and can also start playing with other young children. Preschoolers can follow simple rules and enjoy playing with other kids. Find old favorites and new games from these articles from KidsHealth.